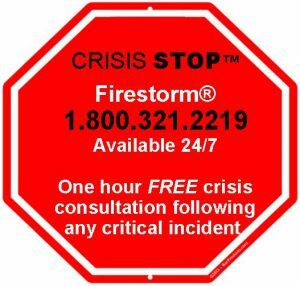 Crisis Management – Crisis STOP™ is a no cost crisis management service developed by Firestorm® for EAF Members. Firestorm will provide up to one hour of crisis management assistance at no cost. This initial consultation slows the process, controls panic, identifies the immediate concerns, provides direction, and lays the foundation for appropriate consequence management. It is designed to improve crisis outcomes while decreasing the frequency and severity of crises. EAF Members – Call 1.800.321.2219 for one hour of crisis management assistance 24/7/365! BERTHA provides a wealth of information about behavioral threats as well as the availability of responding resources. EAF and Firestorm are introducing this program and with special discounted pricing for the license fee for all members! Members receive preferred pricing on all R3-Continuum and Firestorm services! Firestorm Transforms Crisis into Value – Firestorm® Solutions, a Novume Solutions (NASDAQ: NVMM) company, is a leading crisis and risk management firm and America’s CRISIS COACH®. Since 2005, Firestorm has assisted clients in transforming crisis into value by responding to some of the largest and most complex crisis events as well as combining best-practice consulting with proven crisis management expertise. Firestorm empowers clients to manage crisis and risk through assessments, audits, program development, insurance partnerships, training and advisory services using the PREDICT.PLAN.PERFORM.® methodology. Firestorm assesses, audits, develops, trains and tests strategies and programs encompassing emergency response, business continuity, crisis management, and crisis communications/PR. Firestorm demonstrates thought leadership in workplace violence prevention, cyber-breach response, insurance-related services, communicable illness/pandemic planning, artificial intelligence, and every preparedness initiative. Firestorm provided crisis management and crisis communications services to Virginia Tech after the shootings and continues to provide services to keep tens of thousands of employees, customers and students safer. Firestorm® is a national leader in crisis/consequence management, communications, emergency response and business continuity consulting services. Firestorm utilizes the tremendous knowledge acquired by its founders, staff and Expert Council, while managing some of this nation’s worst crises, to provide critical decision support to its clients. R3 Continuum (R3) offers a continuum of solutions to assist organizations with every phase in the business planning, absence management, and return to work cycle. Collectively our services can ensure that organizations are ready for major disruptive events, able to respond successfully to these events (including workplace or threat of violence incidents), and equipped to accelerate employee recovery and return to work outcomes. R3 is a recognized leader in providing comprehensive solutions for complex claims and situations, and we guarantee to provide the right solutions with the right people at the right time.